On January 5, I posted the message below on Facebook to hold myself accountable to my New Year’s resolution. It’s simple. I want tech businesses to grow and thrive in Nigeria outside of Lagos. 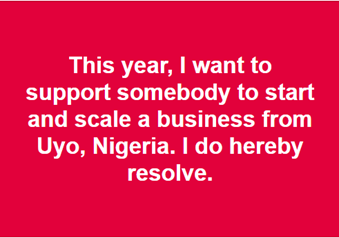 I want to support someone who grew up in, works in, and wants to continue working in my hometown, Uyo. This is not just my resolution, but has been my life’s work since I started Start Innovation Hub five years ago. Start Innovation Hub is an ICT firm and innovation lab that works to expand the tech industry by supporting tech startups and talented individuals in Uyo. We build skills and connect entrepreneurs to economic opportunities, as well as support local businesses by developing software solutions. You can’t deny that the tech sector in Nigeria is growing rapidly, but the concentration of firms in Lagos means that places like Uyo are left behind. Through Start Innovation Hub, I hope to change that. So why am I so adamant about supporting other businesses from Uyo? I want people to know that there is talent everywhere in Nigeria—Uyo, Edo, Port Harcourt, Calabar, Kaduna, Akure, Kano, Jos, you name it. But talent doesn’t mean opportunity. This is why people, especially in the tech industry, flock to Lagos in search of opportunity. My goal is to work with these talented people to create opportunity in their hometowns and encourage them to work locally. I know this has been said a million times, but we need local people solving local problems and that only can happen if talented people stay local, focusing their efforts on local problems. In the tech industry in Nigeria, similar to other countries, the rural to urban migration is ever apparent. Those trained as software engineers or digital marketers, for example, quickly move to big cities that demand those services. But, the problems that can be solved with tech still exist outside of those cities, and every time someone leaves we lose that talent and say goodbye to a problem-solver. There was a time when migration to cities meant opportunity, but now that is not necessarily true. The beauty of working in tech is that it can be done from anywhere with power and access to internet. My hope is that more people understand that opportunities in the tech sector exist outside of major cities and decide to stay in their local communities, so when people talk about a tech-enabled Nigeria, they are talking the country as a whole, not just Lagos. So What Advice Would I Give Uyo Businesses I Plan to Support? Learn from others: Pay attention to what others are doing and learn from their successes and failures. In Uyo, we may not always be on the cutting edge in the tech sector, but being a few steps behind can work to our advantage. It means we are able to learn from the failures of others. For example, I have worked with multiple businesses both in Kenya and India that are not longer in existence because they were dependent on donor funds. This knowledge informed Start Innovation Hub’s business model that now generates revenue without donor funds. Work with what you have: It’s true a faster internet makes my job easier, but a fast connection is not always guaranteed in Uyo. Don’t let a slow connection discourage you. The first rocket that went to the moon did not have internet and my computer is more powerful than that. You can do a lot more than you think with inconsistent WiFi or 2G. Take advantage of every opportunity you get: The online universe provides countless opportunities that enable us to connect to anyone anywhere at any time. Take advantage of that. I am part of Facebook Hub Partner Network, Network of Niger Delta Incubators and Accelerators (NoNDIA), Google Developer Groups, Facebook Developer Circles, AfriLabs and the DigiClan Community, to name a few. Join these groups and use them to your advantage. Network as much as possible and you’ll be surprised by how many opportunities fall into your lap. Collaboration over competition: Because Uyo is a low-income city and the majority of working people are civil servants, there are not many thriving businesses. My success comes from working with the businesses that do exist, and figuring out how we can help each other, rather than competing against one another. Together, we are trying to spark a culture of entrepreneurship in our community, a culture that won’t thrive if we don’t create opportunities together and prove that there are attractive job prospects outside of government salaries. Collaboration is key to this process. So, if you are a small business in Uyo, or a struggling entrepreneur with a great idea, please contact me. Together, we can solve the problems happening around us and prove that tech companies can thrive anywhere. Hanson Johnson is the founder and CEO of Start Innovation Hub. He is also the country mentor for Google Developers in Nigeria, where he works with the Developer Relations Team at Google to ensure developer welfare and supports local developers to build sustainable technology ecosystems in their local communities. 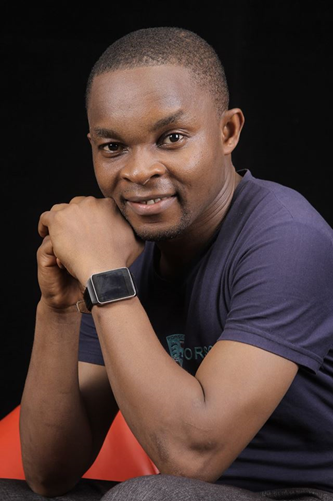 Since 2010, he has contributed to the development of the technology ecosystem in Nigeria as a software engineer, ecosystem builder, manager, and mentor. To reach out to Hanson, feel free to message him on Facebook or Twitter.